The renowned nursery, orphanage and captive breeding for Asian Elephants which is located at the Pinnawala Village. It is known to have large herds of elephants and is a sanctuary for orphaned baby elephants that were found in the wild. Your tour of Kandy will not be complete without seeing the magnificent and flourishing gardens of the Royal Botanical Garden of Peradeniya. It represents a significant national asset for Sri Lanka. It is located about 5.5km to the west from the city of Kandy which attracts a lot of visitors to take a look at the variety of orchids, and a lot of the species of plants. Be mesmerized by its beauty and variety. As being the island of festival, get a chance to experience one of the most spectacular events of the year. 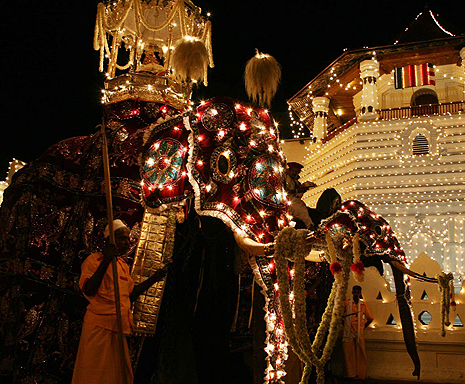 The annual Kandy Esala Perahara where the sacred tooth relic of Lord Buddha, encased in a golden casket, is taken in procession on the back of the magnificently dressed elephants along the streets of Kandy. You will get a chance to view this festival, take a look at the variety of dances and performers as they take their procession through the streets. Arrival transfer to Clarion, 1 night accommodation on double/ twin sharing basis at Hotel Clarion on BB basis, services of an English speaking chauffeur in a car, Pinnawala Elephant Orphanage, Peradeniya Royal Botanical Gardens excluding Perahara seats, transfer to Clarion.